Hemoglobin A1c testing devices are used to determine and monitor hemoglobin A1c levels in diabetic patients. For more than 400 million people affected with diabetes across the world, blood testing has become a routine part of managing the disease. The A1c test measures the average blood glucose over the past two to three months. It is also known as the glycosylated hemoglobin test, glycohemoglobin test, glycated hemoglobin test, or A1c. The global hemoglobin A1c testing devices market is expected to expand at a high CAGR during the forecast period, owing to factors such as high prevalence and increase in the incidence of diabetes, rise in the geriatric population, increase in employer-sponsored medical programs, improvements in health care facilities, and rise in medical tourism. However, the growth of the market is likely to be hampered by the absence of health insurance schemes and lack of medical professionals in developing countries. In terms of technology, the market has been segmented into ion-exchange high-performance liquid chromatography, immunoassay, boronate affinity chromatography, direct enzymatic assay, and others. Ion-exchange high-performance liquid chromatography segment dominated the market in 2017. It is likely to remain dominant during the forecast period, in terms of revenues. The growth of the segment can be attributed to the excellent specificity and reproducibility of Ion-exchange high-performance liquid chromatography and its ability to detect the most common Hb variants. However, the high cost of HbA1c treatment using the Ion-exchange high-performance liquid chromatography method compared to other techniques is likely to induce patients to adopt other techniques. Based on end-user, the market has been classified into laboratories and point-of-care (POC) settings. The laboratories segment has been further sub-segmented into commercial laboratories and others. The point-of-care (POC) settings segment has been further divided into hospitals, home care, clinics, and others. The growth of the laboratories segment can be attributed to factors such as a rise in the number of cases of diabetes type II, enhanced diagnostic care services, and availability of a wide range of services at a single site in commercial laboratories. However, a rise in diagnostic costs and changes in reimbursement models are estimated to hamper the segment during the forecast period. In terms of region, the market has been segmented into North America, Europe, Asia Pacific, and Rest of the World. North America and Europe, cumulatively, accounted for over 70% market share in 2017. They are anticipated to remain dominant in terms of revenue during the forecast period. North America is expected to lead the market, owing to the presence of leading market players in the region. According to Endeavor Business Media, LLC, HbS and HbC are the most common genetic variants impacting 383,000 people in the U.S.. Due to the prevalence of genetic variants in U.S., the estimated incidence of HbS and HbC has increased to one third of all diabetes patients worldwide. Further, favorable reimbursement policies, expansion of distribution networks by key players for hemoglobin A1c testing devices, increase in the incidence of diabetes among the geriatric population, and rise in funding provided by governments are anticipated to propel the segment during the forecast period. The market in Asia Pacific is likely to expand at a high CAGR in the coming years. 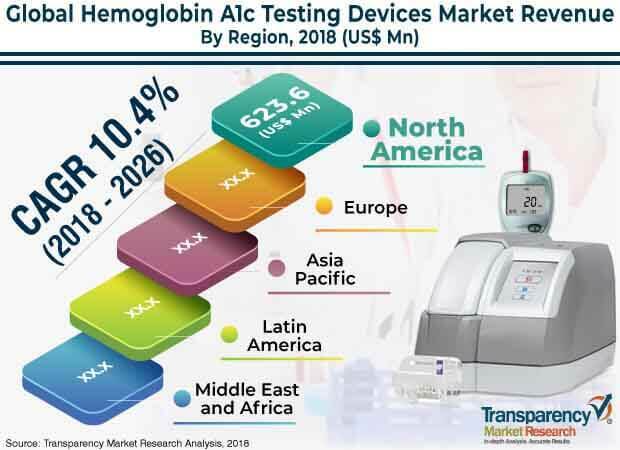 The ever-increasing population in the region, unmet medical needs, rise in the prevalence and incidence of diabetes are some of the factors expected to drive the hemoglobin A1c testing devices market in Asia Pacific during the forecast period. Moreover, developments in the field of science, high disposable income, and rise in per capita health care expenditure are expected to propel the market in the region. Key companies operating in the global sinus dilation devices market include Siemens, Healthineers, Abbott Laboratories, Arkray, Inc., Bio-Rad Laboratories, Inc., Polymer Technology Systems, Inc., Danaher Corporation (Beckman Coulter), EKF Diagnostics Holdings plc, F. Hoffmann-La Roche Ltd., Menarini Group, Sebia, Tosoh Corporation, and Trinity Biotech plc. The global hemoglobin A1c testing devices market report comprises an elaborate executive summary, which includes a snapshot that provides information about various segments of the market. It also provides information and data analysis of the global market with respect to the segments based on technology, end-user, and region. A detailed qualitative analysis of drivers and restraints of the market and opportunities has been provided in the overview section. Additionally, the section comprises a competitive matrix and company profiles along with business overview to understand the competitive landscape in the market. This section of the report also provides market attractiveness analysis, by geography, thereby presenting a thorough analysis of the overall competitive scenario in the global hemoglobin A1c testing devices market. In terms of technology, the global hemoglobin A1c testing devices market has been segmented into ion-exchange high-performance liquid chromatography (hplc), immunoassay, boronate affinity chromatography, direct enzymatic assay, and others. Based on end-user, the market has been classified into laboratories testing and point-of-care (POC) settings. The laboratories testing segment has been further segmented into commercial laboratory and others. The point-of-care (POC) settings segment has been further categorized into hospitals, home care, clinics, and others. The POC settings segment is anticipated to expand at a significant CAGR during the forecast period. The market has been analyzed based on price variations, technology trends, and presence of key players. The market size and forecast for each of these segments have been provided for the period from 2016 to 2026, along with their respective CAGRs for the forecast period from 2018 to 2026, considering 2017 as the base year. In terms of region, the global hemoglobin A1c testing devices market has been segmented into five major regions: North America (the U.S. and Canada), Europe (the U.K., Germany, France, Spain, Italy, and Rest of Europe), Asia Pacific (China, India, Japan, Australia & New Zealand, and Rest of Asia Pacific), Latin America (Brazil, Mexico, and Rest of Latin America), and Middle East (South Africa, GCC Countries, and Rest of Middle East & Africa). The market size and forecast for each of these regions and the mentioned countries have been provided for the period from 2016 to 2026, along with their respective CAGRs for the forecast period from 2018 to 2026, considering 2017 as the base year. The research study also covers the competitive scenario in these regions. The report also profiles major players in the market in terms of attributes such as company overview, financial overview, product portfolio, business strategies, and recent developments. Key companies profiled in the global hemoglobin A1c testing devices market include Siemens Healthineers, Abbott Laboratories, Arkray, Inc., Bio-Rad Laboratories, Inc., Polymer Technology Systems, Inc., Danaher Corporation (Beckman Coulter), EKF Diagnostics Holdings plc, F. Hoffmann-La Roche Ltd., Menarini Group, Sebia, Tosoh Corporation, and Trinity Biotech plc.